I have some good in depth tech posts to come including a complete restoration on a Simmons SDS V ( another one! ). But to tide you over i would like to present : The Roland Synthesizer History Chronicle. I quoted and edited from their site as i prefer to start at the beginning and not the end… And I lose interest after L.A. Synthesis. I really enjoy the descriptions on this list. Classic Roland manual writing has a special kind of ‘Engrish’ and it’s in full force on this list! JD800 : Because it looks awesome. Just amazing with tons of realtime sliders at cool looking angles . SH5 : Great source and modulation capabilities. Similar to the more advanced Yamaha CS series synths. I like the blue more than the SH7 green. Jupiter 8 : This is a beautiful machine. Sounds great. Built like a tank. JX8P : This one makes the bucket list way before the JX3P which is more popular. It can make gritty yet classy analog love and is capable of seriously complex tonality. Juno 60 : Again, it’s simple and classy. Cooler to me than the JX3P with the arpeggiator and doesn’t need a programmer. Plus you can save patches unlike it’s predecessor the Juno 6. SH101 : It COMES IN MULTIPLE COLORS!!!!! And it’s super popular with techno / dance and electronic crowds. I take one in red with the keytar hand grip please. JP 8080 : This looks great and packs a wallup! If i saw one cheap i’d pounce. Decent layout for a box that does too much and its much easier on the eye than the JP8000. This 1VCO analog synthesizer’s claim to fame is being the first mass-production synthesizer made in Japan. It had a selection of preset tones to choose from, and control functions to give the user freedom when producing sounds. It carried a price tag of ¥165,000 in Japan (roughly $600). 1VCO analog synthesizer making full use of control functions. There are two types — the SH-3 and SH-3A (photo) — which differ slightly in terms of appearance and internal construction. Additive synthesis oscillation creates a distinctive meaty sound. This preset-only analog synthesizer (1VCO) is equipped with aftertouch. Although Roland analog keyboard synthesizers have 1V/1oct VCOs, this one uses Hz/V. Roland’s first 2VCO analog synthesizer. The huge one-piece case blew away keyboardists at the time. This synth was also the first to have pitch bender levers. 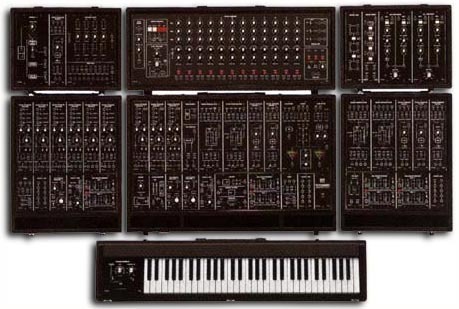 This system consisted of a small 2VCO synthesizer, expander, mixer, analog sequencer, and a pair of speakers (photo showed the basic model 101 synth). It was possible to purchase each unit separately. The first — and only — modular synth to be made in Japan. It included 9VCO, 4VCF, 5VCA, 4ENV, 3LFO, mixer, analog sequencer, effects processors, and more. The full system was priced at ¥2,650,000 in Japan (roughly $9,000). A 1VCO analog synthesizer with a basic circuit design derived from Roland’s System-700. In addition to being the first synth to incorporate a sub-oscillator, it was also the first to use a molded plastic case. This 2VCO analog synthesizer was released as the successor to the SH-5. The case was made somewhat smaller, and it could play two voices, taking advantage of the two VCOs. A number of cost-cutting measures were applied to the SH-1. The result was this 1VCO analog synthesizer, the first to sell for below ¥100,000 in Japan (roughly $450). This synth played a major role in popularizing synthesizers in Japan. A version of the System-700 aimed more at the general consumer. This compact modular synthesizer was made up of various modules and a rack with built-in power supply (a 32-key and 49-key keyboard was available). The meaty sound of 2VCO + 1 sub-oscillator made this analog synthesizer quite popular. 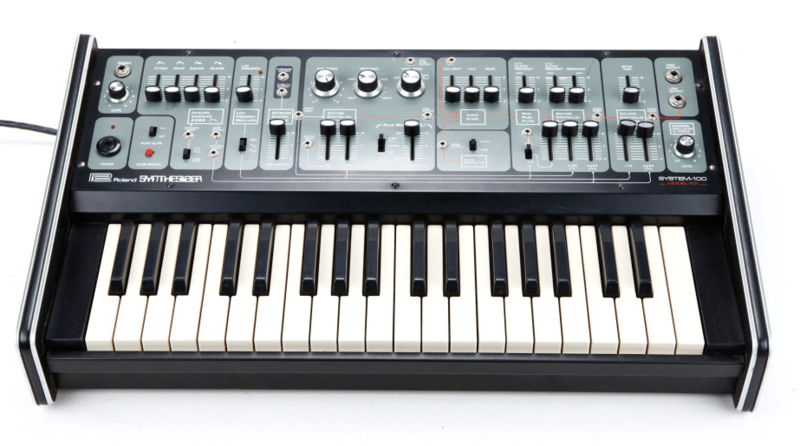 As with the SH-09, a price of under ¥100,000 in Japan (roughly $450) propelled this synth’s popularity. It’s a coveted classic. 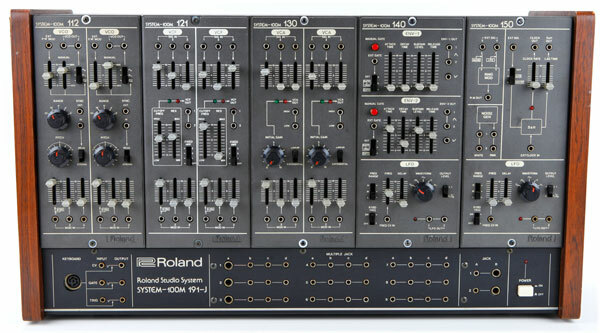 Roland’s first polyphonic analog synthesizer (4 voices). The 4VCO sound in unison mode is superb, and it also has built-in user sound memory function. 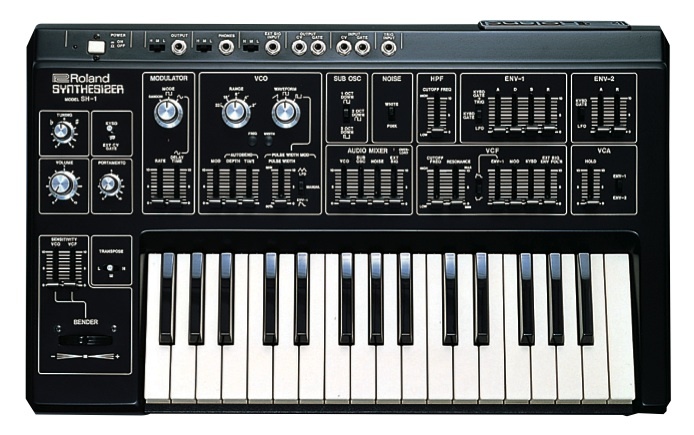 The synth carried a price tag of ¥385,000 in Japan at the time (roughly $1750). A deluxe 8-voice polyphonic analog synthesizer with 64-sound memory. Its smorgasbord of features, including key split, patch preset, and auto arpeggio, earned this synth global praise and legendary status. This 6-voice polyphonic analog synthesizer used a DCO per voice to generate sound. Built-in chorus effects increased the range of sounds that could be produced. This synth also had a key transpose feature. A 1VCO analog mono synth available in three color variations; modulation grip was also an option. The synth could run on batteries, allowing it to be slung on a shoulder strap and worn like a guitar. A Juno-6 with newly added memory functions for 56 sounds. Roland’s proprietary DCB interface standard was used for exchanging control information with external devices. Scaling down the Jupiter-8 to 6-voice polyphony, coupled with creative tweaking by Roland’s engineers, allowed the Jupiter-6 to hit the market at half the price of the Jupiter-8. It also made news with its highly stable oscillator and MIDI terminal. This MIDI-capable, 2DCO per voice, 6-voice polyphonic analog synthesizer was released at the same time as the Jupiter-6. A PG-200 sound programmer (could be placed on the upper right on the panel) was also available. This 1DCO per voice, 6-voice polyphonic analog synthesizer was the successor of the Juno-60. Equipped with 128-sound memory and MIDI, it would become a favorite of dance and techno artists. A 2U-rack vesion of the JX-3P. Although the JX-3P’s MIDI receive channel was fixed to ch. 1, the MKS-30 has programmable channels. The PG-200 sound programmer for the JX-3P could also be with this model. 2U-rack size, 8-voice polyphonic version of the Jupiter-6. Nicknamed the Super Jupiter, it stood out for its ability to play a wide range of sounds, from musical instruments to special effects. The MPG-80 sound programmer was also available as an option. An upgraded version of the JX-3P, the JX-8P analog synthesizer featured 6-voice polyphony and two DCOs per voice. A separately sold PG-800 sound programmer was also available. This JUNO was equipped with stereo speakers; other than that, the specs were completely identical to the JUNO-106. As a common feature in this time — internal sound memory could be backed up to a cassette tape. Pronounced “alpha JUNO-1″, this was a low-cost model in the JUNO series. It had 49 keys, and a specially designed sound-generator IC. Although it had 6-voice polyphony and 128 sound memory, it was below ¥100,000 in Japan (roughly $420) – quite an appealing combination. A step up from the α JUNO-1, the α JUNO-2 had 61 keys. The JUNO series was always popular for its string and bass sounds, and still is to this day. The PG-300 programmer, common to the α JUNO-1 and -2, was also available. This 76-key, DCO-type analog synthesizer incorporated 2 JX-8P sound generators. With 12-voice polyphony, this synth was nicknamed the Super JX. The PG-800 sound programmer could be used with it. A rack version of the JX-10, this model could also use the same PG-800 sound programmer as the JX-10. Equipped with three different effects — portamento, delay, and chorus — it also had a memory cartridge slot. This rack-mounted model of the α JUNO series made it possible to add portamento, detune, and other parameters to patches. It was equipped with chord memory, and could also use the PG-300. Equipped with the Linear Arithmetic (LA) synthesis, this was Roland’s first digital synthesizer. It also had a digital filter/effects processor. One of Roland’s best-selling models, this synthesizer also excelled at analog-style sound. This rack-mounted version of the D-50 synth also had an LA sound generator. Creating sounds was made simply by using a PG-1000 external controller that enabled manipulation of edit parameters in real time. Although this digital synthesizer was reasonably priced, it borrowed the D-50’s LA sound generator, and also had multitimbral capability and rhythm machine functions. It had seven types of digital reverb, and the first built-in ROM player. A stand-alone version of the D-10 sound generator, this sound module fit in a 1U rack. In addition to its main stereo output, it also had six individual outputs. 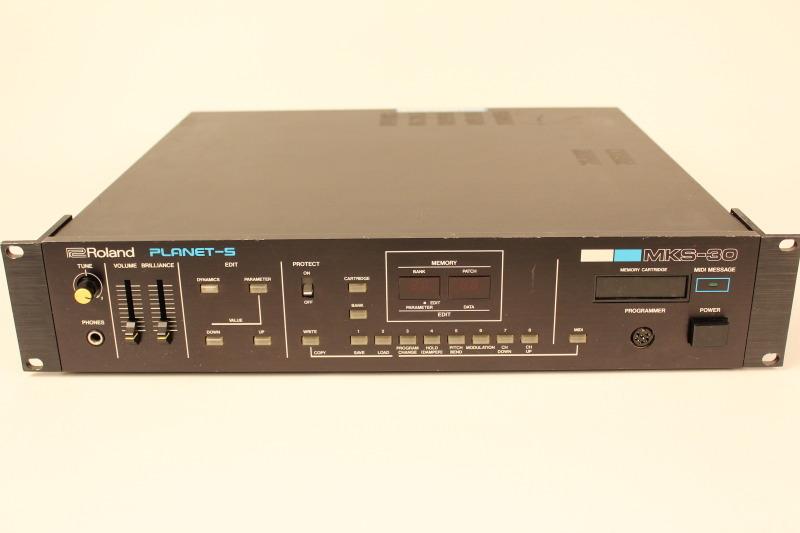 This model contained the same basic features of the D-10 but added a sequencer capable of 9-track multi-recording and a 3.5-inch floppy drive. The sequencer supported real time recording method. A simple-playback sound module with a DC-PCM sound generator. In addition to a wide range of built-in musical instrument tones, it could hold up to four memory cards at once. By combining these, users could create custom sounds. This keyboard used the RS-PCM sound generator, which retained compatibility with the U-110′s tone data. It was distinguished by a unique system of operation, with sound patches that managed tone data, and keyboard patches that managed MIDI data. The greatest feature of the D series was an onboard LA sound generator. With a chase function and arpeggiator at a price of ¥99,800 in Japan (roughly $725), this synthesizer offered outstanding cost performance. Employing the RS-PCM sound generator system, this upper model of the U-110 aimed at even higher sound quality. Preset tones were increased from 99 in the U-110 to 128 in U-220, and an onboard effects processor provides built-in chorus and reverb. This synthesizer used Advanced LA synthesis, which is an evolved form of LA synthesis. It had a built-in DLM function that could generate a variety of wave data for synthesizing. This innovation created an infinite range of sound creation possibilities. This digital synth employed a large number of sliders on the panel to allow real-time control of all parameters with an analog feel. Each Patch could consist of up to four Tones for creating fat sounds. While low priced, this playback keyboard had the ultimate selection of preset sounds, from acoustic instruments to analog synthesizers. It also had an edit function with eight parameters. With eight paramaters sliders, this PCM synthesizer could be operated with an analog feel. This was the first synth compatible with the best-selling SR-JV80-Series expansion board. The lower model of the JV-80, this 16-part multitimbral synthesizer captivated users with its 189 high-quality, built-in PCM tones and ease of operation. Editing filter, envelope generator, and vibrato was possible. This PCM sound module, with the high-quality sound and functionality of the JV-80, was made to fit into a compact 1U rack-size. In addition to four main and sub outputs, the module has a Preview function that allowed users to check tones without using any other equipment. This workstation had an onboard GS sound generator with a built-in 16-track sequencer. In addition to a backing function as a composition-support tool, the JW-50’s ease of editing tones made for an appealing instrument. This workstation featured a refined version of the JV-80 sound generator, with a built-in MC-50MKII sequencer engine. Expansion boards made this workstation expandable up to 993 patches, and 56 voices. This model offered superb cost performance. While low priced, it allowed expansion boards to be installed, adding extra sounds and voices The separately sold VE-JV-1 provided the synth-engine equivalent of the JV-1000. The JV-1000 synthesizer with the sequencer removed, the JV-90 was based on the concept of expandability. Expansion boards could be used to expand the number of voices and sounds as needed. This model featured the same functions as the JV-35, with a built-in SMF player. As with the JV-35/90, it was based on the JV-series concept of expandability, capable of up to 56 voices. Intended for Professional Use / Church Environment (Complete library of rich Organ sounds,etc). This keyboard was a collaboration with Rodgers Organ (a Roland subsidiary). This sound-generator module achieved the operability of the JD-800 via a large-screen display. In addition to enabling ring modulation and oscillator sync, it was equipped with an FXM function and eight multi-effects processors. This synthesizer module featured 64 voices and 16-part multitimbral specs. Nicknamed the Super JV, the module could carry four wave expansion boards simultaneously, enabling up to 1,741 patches that spanned a wide range of music genres. This workstation featured the sound generator of the JV-1080, and a sequencer with loop recording and quick play. It also featured Realtime Phrase Sequence (RPS). This XP-series model was aimed at the more affordable price range. Equipped with 16-part multitimbral GM/GS sound generator, it also incorporated a newly developed arpeggiator with 30 different styles, a Combination Palette, and more. The top model in the XP series, this synthesizer was based on the XP-50 with many refinements added on, plus 76 keys with weighted action. The sequencer memory could hold about 60,000 notes, three times that of the XP-50. This 8-voice synthesizer offered an impressive array of knobs and sliders to manipulate its analog modeling synthesis engine. It had a built-in Motion Control function that allowed operations on the panel to be recorded and played back. This sound module became so popular, it was considered a world standard. With features such as 640 patches and 16 multitimbral parts, it represented the pinnacle in sample-playback synthesis at the time. This model compressed the features of the XP-80 into a compact 61-key body. All operations conformed to the XP-80. New expansion boards went on sale at the same time, increasing the appeal of this instrument even further. The playability of a keyboard was added to the functionality of the MC-505 Groovebox, which was a hit product at the time. The main appeal of the model was easy operation with inspiring realtime operation. This rack version of the JP-8000 sound generator upped the power even more. Built-in Unison and Voice Modulator, an increase in polyphony from 8 to 10, and external audio input were some of the features that distinguished this module. The last model in the XP-Series. Although the sequencer was removed in order to lower the price, it boasted a full lineup of features, including 1,406 patches and an arpeggio function. This compact half-rack module inherited the rich preset sounds of the JV-1080 and 2080. Able to hold one SR-JV80-Series expansion board, it could handle up to 1,151 patches. While reasonably priced, this synthesizer contained the same high-quality sounds as the JV/XP/XV series. It was also easy to operate, with knob controls for LFO, filter, and other parameters. The XV-88 was the full-sized keyboard model of the XV series. This 128-voice synthesizer was equipped with an 88-key, hammer-action keyboard. It could hold up to four expansion cards (two SRX series and two SR-JV80 series). This 2U-rack synthesizer module had the same sound generator as the XV-88. It could hold up to two SRX-series and four SR-JV80-series sound expansion boards. The top-of-the-line XV module, it had the highest-performance sound generator of its time, as well as a smorgasbord of attractive features, including Matrix Control and sample playback via SIMM. A new breed of workstation with a large graphical LCD and centralized control of its numerous functions. This 76-key workstation featured professional XV-5080 quality sounds and a wide range of realtime performance functions. This 64-voice, 16-part sound module fits the high sound quality of the XV-5080 into a 1U-rack size. Editing software is also included that allows all parameters to be controlled via computer. After 20 years in retirement, the “SH” prefix was revived. This ambitious product integrates the traditional panel interface to evoke images of the first SH-series, plus programmable arpeggiator and many other new features. The XV-2020 synthesizer module put Roland’s acclaimed XV sounds in a half-rack unit with USB and GM2 compatibility. It offered two SRX expansion boards, 16 multitimbral parts, and three effects processors. The V-Synth integrated Variphrase technology, allowing realtime control of waveform pitch, time, and formant for organic and animated sounds. It also offered analog-modeling synthesis, COSM filtering, and the unique TimeTrip Pad. This 61-note workstation keyboard offered seamless integration of audio and MIDI with advanced sampling features such as realtime time-stretching and Skip Back Sampling, plus a Dynamic Pad Bank, mastering effects, and USB file exchange. With a fresh collection of quality sounds, a Loop Sequencer, and friendly Direct Access buttons for instantly selecting patches, the RS-70 introduced a new level of performance power for live or song production at an attractive price. A scaled-down version of the RS-70, this live-performance synthesizer provided great Roland sounds and performance-friendly features including Phrase/Arpeggio Generator and Multi Chord Memory to the entry-level market. Thanks to its open-ended hardware/software system, VariOS could emulate Roland’s most popular synths. VariOS 8 emulated Roland’s vintage Juno and Jupiter, and VariOS 303 emulated the classic TB-303, without draining the host computer’s CPU. The Fantom-X Series were the first “Giga-Workstations,” providing nearly 1GB of wave memory when fully expanded with four SRX cards. They also offered 128-voice polyphony, eight stereo audio tracks, and a large color LCD. Budget priced yet big on features, the Juno-D offered 640 of new patches, a world-class array of expressive multi-effects, realtime performance controllers, and tools for groove creation and composition. The stunning sound of a Fantom-X workstation in a 1U rack module, the Fantom-XR provides room for over 1GB of sounds when fully expanded with six SRX cards and DIMMs for user sampling. For musicians who craved Fantom power, but wanted a more cost-effective way to Fantomize their rig, the Fantom-Xa was the answer — a multifaceted sampling workstation with a 16-track sequencer and affordable price tag. This 49-key analog-modeling synthesizer provides the famous Roland Super SAW waveform. It also has an External Input for manipulating audio, a D Beam, and plentiful knobs and switches for realtime control. Named the “Synthesizer of the Year” at the 2004 MIPA Awards, Roland’s groundbreaking V-Synth now has a travel-friendly offspring. The XT is a portable new V-Synth with some spectacular tricks up its sleeves — and with enough synthesis and audio-processing power to make heads spin. For songwriters and performers, the JUNO-G synth offers a 16-part MIDI sequencer with four companion stereo audio tracks, plus a powerful Fantom-X-quality sound engine, 128-voice polyphony, and SRX expansion. Onboard dual-core engine supercharges Elastic Audio Synthesis with revolutionary Articulative Phrase Synthesis, which models the performance behavior and nuance of acoustic music instruments, plus Vocal Designer. With its dual SRX expansion bay, built-in USB audio interface, and ability to play SMFs and WAV/AIFF/MP3 files, SonicCell puts the power and legendary sound quality of a Roland hardware synthesizer on the desktop. Decked out with an extra-large display, USB backing-track functionality, a Click output for drummers, performance knobs, hands-free patch select, master MIDI control, and more, the 76-key JUNO-STAGE offers onstage power at a great price. The Fantom-G6 is a dream instrument that redefines the boundaries of playability and creativity with its advanced sound engine, revolutionary ARX SuperNATURAL™ expansion bay, large-sized color LCD, powerful new audio/MIDI sequencer and more. The Fantom-G series redefines the boundaries of playability and creativity with its advanced sound engine, revolutionary ARX SuperNATURAL expansion bay, large-sized color LCD, powerful 152-track audio/MIDI sequencer, and more. The battery-powered AX-Synth is an eye-catching 49-key remote keyboard with a high-quality sound generator onboard. It’s self-contained and equipped with powerful, solo-oriented sounds from Roland’s latest generation of synths. A traveling musician’s dream, the JUNO-Di is lightweight, can run on batteries, and is easy to use. It’s packed with 1,000+ great sounds, has a friendly control panel for easy editing, and a Song Player for larger-than-life performances. With a legendary Virtual Tone Wheel organ and dedicated harmonic bars onboard, plus banks of essential ensemble sounds, the V-Combo melds an entire rig into one convenient instrument for easy transport and fast setup. This 37-key ultra-light synth is designed to fit all musicians — even kids. It’s loaded with 150 excellent sounds, all easily selectable with the onboard category buttons, and features a USB Audio Player function for jam-along fun. Affordable yet powerful, the GAIA SH-01 is a high-performance value with old-school charm. The triple-stacked engine provides massive virtual-analog synthesis under the control of hands-on knobs, sliders, and buttons. What propels this power-synth into another realm, however, is its supercharged feature set with over 1,300 fresh sounds, an onboard eight-track digital recorder, and pro effects created by BOSS. Write, record, mix, master, and perform anywhere with the new JUNO-Gi. A live-performance powerhouse that pays homage to its legendary namesake with road-proven hardware and massive sound, yet blasts into the future with advanced SuperNATURAL® technology. By combining the supreme expression of the JUPITER-80 with the travel friendliness of the JUNO series, the new JUPITER-50 brings SuperNATURAL® sound and pro performance to every stage and studio. The powerhouse rack comprises a “greatest hits” collection of sounds from Roland’s flagship keyboards and V-Drums modules, plus a coveted lineup from the legacy SRX library. It also introduces a new technology called Motional Surround, a 17-part ambience engine that lets you graphically control the distance and position of each part within 360-degree sound field. Travel-ready, affordable, and outfitted with top-level Roland sounds, the V-Combo VR-09 is the ideal all-in-one solution for performing keyboard players. Dedicated piano, organ, and synth sound engines—organized in three intuitive blocks on the front panel—provide all the essential tones you need, right under your fingertips. Hey, I have considered getting the software package DubTurbo Beatmaker and was hoping anybody could give me an actual bona fide critique of the software. Many of the webpages that provide experiences are generally affiliate marketers endorsing the software program so that i don’t believe that the reviews are the real deal. Thanks in advance for any information any one can provide. I don’t have that software. I actually don’t use any virtual instruments in my productions. Only actual boxes synced together! It would be nice to include the Roland S-series samplers in this lineup, because these machines provided fully programmable synth engine on top of sampling. So, I would include all these wonderful machines here: S-50, S-550, W-30, S-330, S-770, S-750, etc. I just yesterday got basically a brand new old stock W-30, it’s a wonderful machines, with U-20/R-8 style samples in ROM, and this wonderful Roland resonant TVF algorithm, multistage envelopes and all. In my view, the W-30 is a very capable synthesizer even if it didn’t have have the A/D converter allowing for sampling. Same with the excellent S-770, with its multimode filters like in the D-70/JD-800. My point is, the Roland samplers are excellent fully programmable synthesizers as well.